It’s hard to remember exactly when I first saw Live and Let Die. As a Bond fan growing up in the 70’s, chances to watch the earlier movies were limited to the occasional video store rental or TV broadcast. I remember taping every Bond movie as it was shown on TV and watching those broadcast dubs over and over again. Certainly LALD was among them, and I have no doubt that, whenever I first saw it, it was the title sequence that hooked me. The image of a naked woman in shadow, flames flickering on-screen. Then a zoom into another woman’s wide-open eyes. Her head turns into a skull. You layer the simple yet ultimately iconic theme song over the images and you have the recipe for movie magic. Who wouldn’t be mesmerised by that? 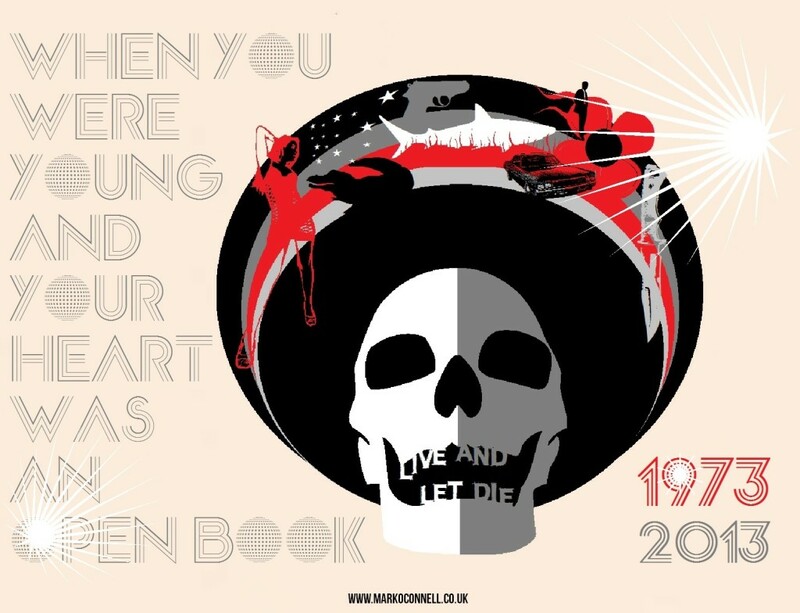 However, this was only the start of my appreciation of Live and Let Die. One of the benefits of looking back at a movie one’s watched for decades is the ability to appreciate the finer subtleties noticed upon repeat viewings. Back in the good old days of Bond watching, I don’t really remember caring whether Bond was played by Moore or Connery (or that other fellow.) The important thing was that I was watching James Bond. 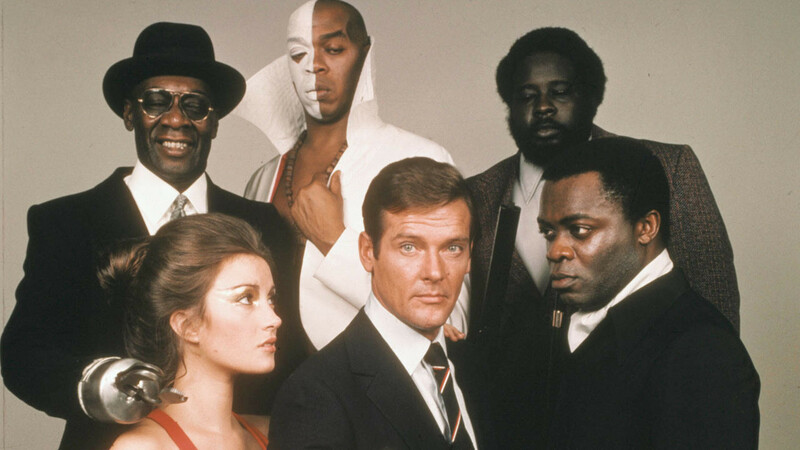 Nowadays, though, I’ve come to appreciate Live and Let Die a lot more because it was such a departure from the Connery Bonds, that it needed to be. Roger Moore had to put his own stamp on the character and he did an absolutely stellar job of it in Live and Let Die. He was a more urbane Bond to Connery’s physical Bond. His quips and mannerisms work well in LALD. Of course, a good Bond is only as good as the villains he fights. Luckily for Moore, he had some of the best for his first outing. We first meet our villain in the opening sequence, as Head of State from San Monique in the UN. Kananga is there to watch the first of three murders. It’s rare that we get to see the primary villain so early in a Bond film, and the reason we get to see him is that, as is revealed later, the British have been watching him. The murders are Kananga’s retaliation. His heroin operation aside, as a Head of State, he is the highest profile target to which Bond has ever been assigned. Kananga is a formidable foe, with virtual armies in both San Monique and the United States. I’ve always loved Kananga as a villain. He brings an energy to the film that makes it (and him) so watchable. His henchmen as well are some of the best in the entire series. Tee Hee with his towering height, hook hand, and sense of humour. Baron Samedi as the enigmatic, yet entirely terrifying, well, Baron Samedi; and silent Whisper. Tee Hee has some great moments with Bond, not least of which is their scene at the Gator farm. And speaking of the Gator farm, the locations are another strong feature for Live and Let Die. After the dusty blandness of Las Vegas in Diamonds Are Forever, Live and Let Die is an absolute breath of fresh air. New York is a city with an energy and a vibrancy all its own. It’s hard to believe that Bond never visited it before (or since). Moore’s Bond fits into the city nicely (for the most part). Jamaica as San Monique also gives the movie a nice Caribbean vibe (a nice callback to Bond’s earlier missions to that area.) For me, though, it’s New Orleans and the Louisiana Bayou that really stands out to me. I used to think of that whole section of the film as padding. But now, I find it’s the part of the film that I look forward to the most. The Gator farm itself is a very unique location and it remains one of the most menacing death traps that Bond’s ever faced. The stunt run across the gators is one of the most iconic moments for Roger Moore’s Bond and, quite frankly, the entire series. Then there’s that boat chase across the Bayou. It’s certainly one of the longest and most breathtaking chases in Bond film history. A strong mix of great action, beautiful scenery and superb stuntwork. It’s great fun to watch over and over again. So Live and Let Die has some great visuals, but it also has some of the greatest music of any Bond film. The soundtrack is, today, one of my absolute favourites of the entire series. It gets regular play on my iPod, and listening to it sweeps me back to the 70’s awesomeness of the film. George Martin’s score blends the right mix of Bond, funk, and Caribbean music together, meanwhile giving it a sinister edge. For example, watching the movie’s opening sequence, we’re treated to the Bond theme, New Orleans spiritual jazz, and a sinister orchestral piece in rapid succession. It shows the disparate influences which Martin was able to bring together and blend into an extremely tight and memorable soundtrack. It’s hard not to listen to tracks like “Whisper Who Dares,” “Baron Samedi’s Dance of Death,” and “Trespassers Will Be Eaten” and not revisit those sequences from the film. That is what the best soundtracks do, and one of the chief reasons that Live and Let Die remains my favourite “one-off” soundtrack from the entire series. Like the casting and locations, the score is another chief that Live and Let Die is such a fun film to watch. Having said all that, though, it does have some issues. It’s almost impossible, however, to ignore the problems at the heart of Live and Let Die. The chief problem is the confused racial message. The white versus black dynamic, for example. Here, pretty much every single black person in the film is working for Kananga/Mr. Big (either directly or indirectly). Take the New Orleans sequences, for example. Murder is committed in broad daylight on his behalf, yet everyone watching does nothing. The voodoo scenes contain the typical Hollywood stereotyping of the religion. Then there’s the whole question of why the British were so interested in Kananga to begin with. We start the film with Kananga obviously retaliating for something via the murder of three British spies. Yet, we (and Bond) never learn why they were doing going after him in the first place. We learn his plans eventually, but they appear to be related solely to the U.S. So were the British spying on him for the CIA? Maybe, but Leiter seems to make it clear that the CIA were watching Kananga on behalf of the British. So again the question remains, why were they after him? As mentioned before, Kananga is a Head of State. Sending a 00-agent suggests that the ultimate goal is assassination. Such a series of events in the real world would result in worldwide outrage. Live and Let Die could never be produced as it is nowadays. It is a product of its time and maybe therein lies the secret of its appeal. Bond films aren’t known for their realism. They are, first and foremost, fantasies. They manage to appeal to the sense of adventure in people for dangerous villains, beautiful women, and magnificent locations. Appealing to this sense of adventure is part of what made the pulps an important source of 20th-century entertainment. Live And Let Die is, perhaps, the ultimate blending of the pulps and James Bond. am a fan of the pulps, and Live and Let Die absolutely fits the pattern of those old stories. It’s been one of my favourites for almost three decades now, and I don’t see that changing anytime soon. How I Discovered #Bond_age_: I was in the right place (Twitter) at the right time.